Mrs. Selfish and I landed in Seoul at 6pm and JUST missed Korean Airlines Limousine Bus #6704. 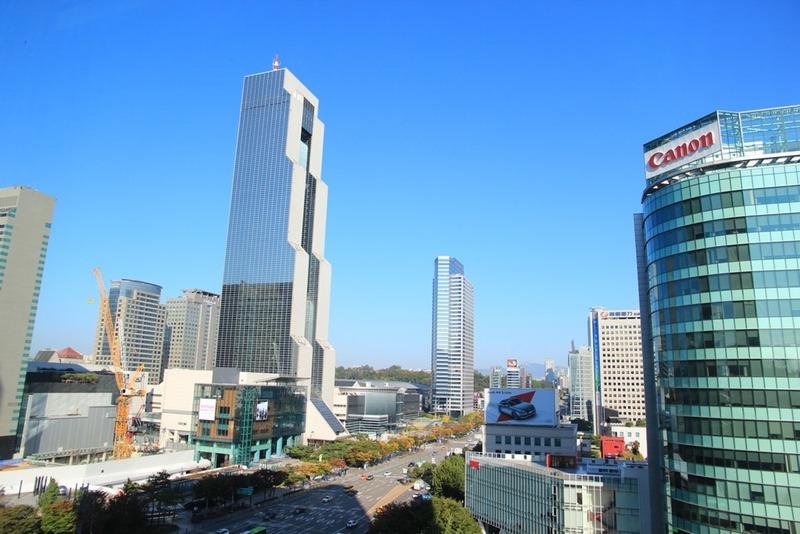 We took a similar bus last time around to the Westin Chosun, and I found it to be a little slow, but well priced. The bus runs roughly every 30 minutes and only costs 16,000 KRW per person (~$16 USD). Unfortunately it takes about 80 minutes to get from the airport to the hotel. Mrs. Selfish and I did the math and figured it would take roughly 2 hours to get from the airport to the hotel since we had just missed the bus, so we decided to grab a cab instead and pay for the difference. The cab cost roughly 90,000 KRW and was definitely on the pricier side. Fortunately, the cab took credit card (turns out just about everybody does in South Korea) and had no problems finding the hotel. 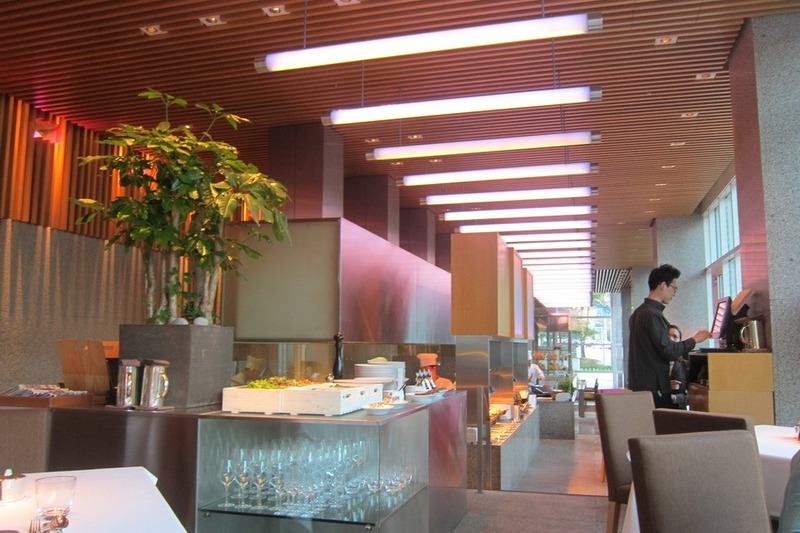 The Park Hyatt Seoul is a category 4 hotel and costs 15,000 points a night. I booked 4 nights using an annual Hyatt free night certificate I received from having the Chase Hyatt Visa card, and 45,000 points. Since a standard room normally goes for over $400, we ended up getting a return of $.0267 cents per point – not too shabby! 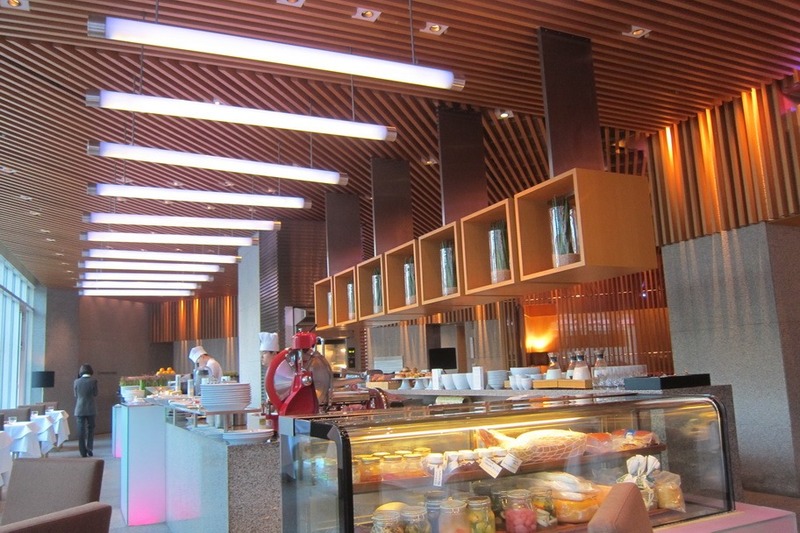 The hotel is gorgeously modern, like most Park Hyatts. 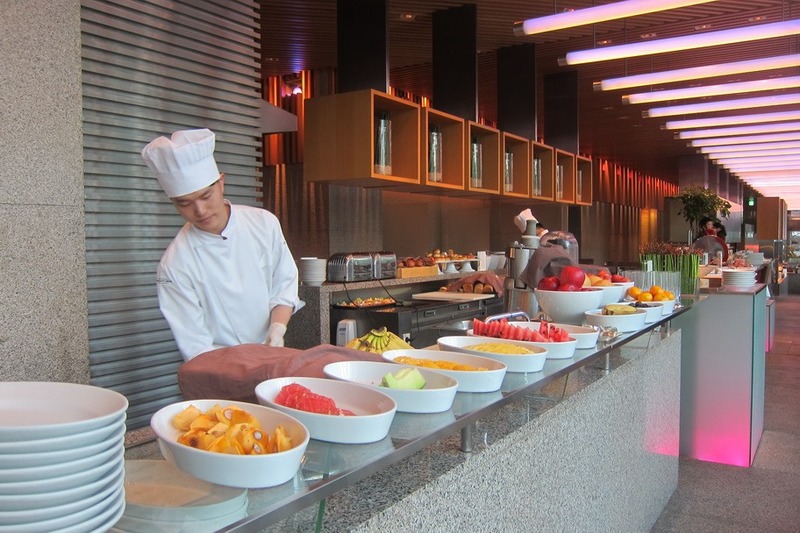 Service is also incredible – though a little aggressive for my taste. To get to your room you have to route through the lobby on the 24th floor before taking an elevator down to your room. 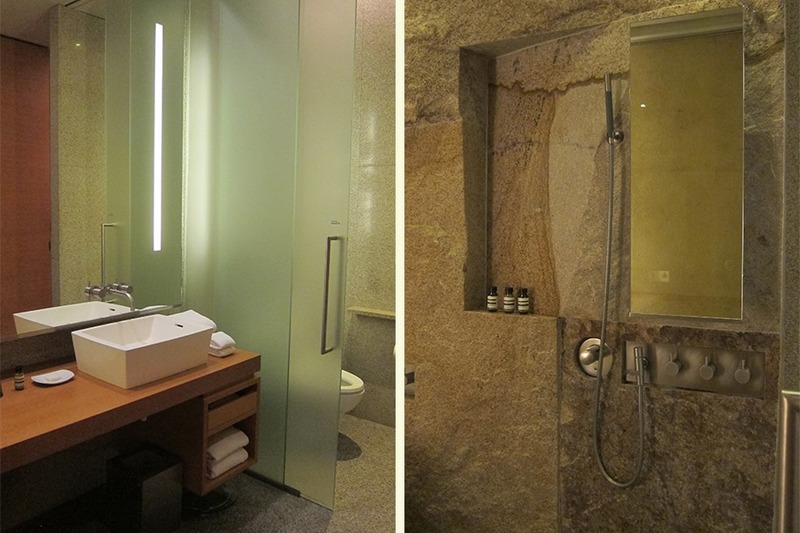 While slightly inconvenient, it does give the hotel a very secluded feel. 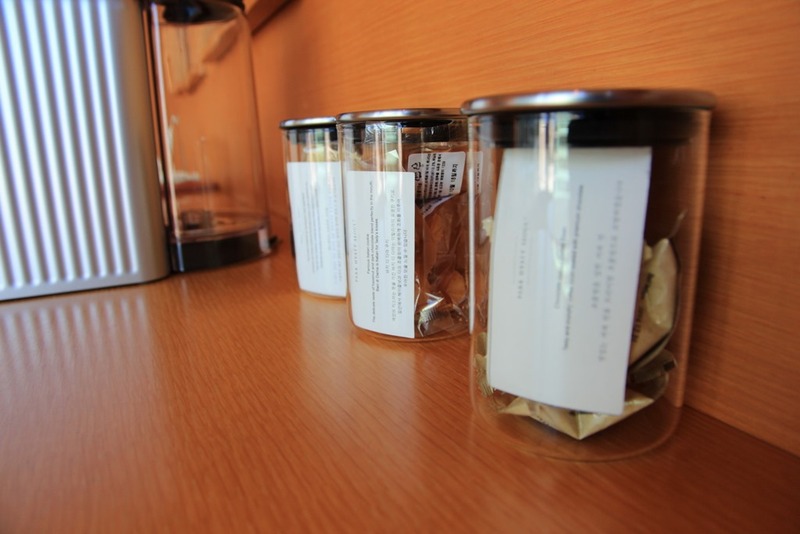 Leaving the hotel is a different matter, however, since coming back to the lobby means you’ll have members of the concierge team bending over backward to greet you and grab the elevator down to the building exit for you. 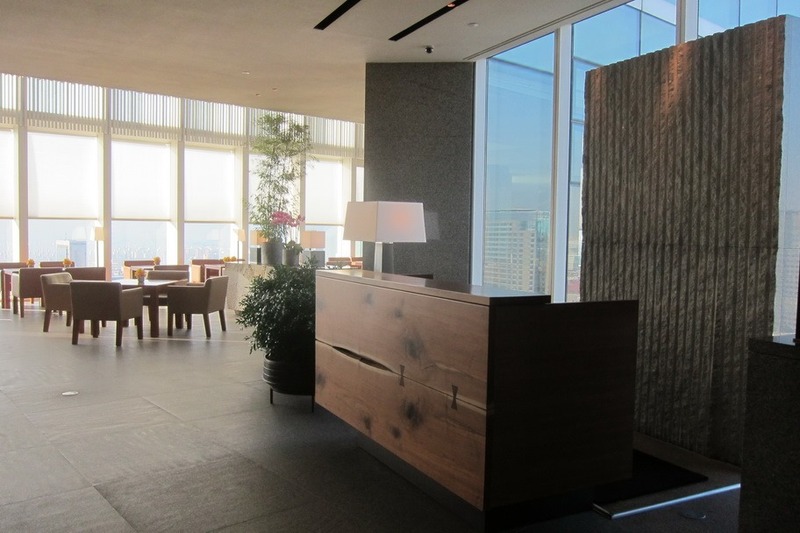 That level of service makes me a little uncomfortable (I’ve gotten caught in bowing loops in North Asia before), but Mrs. Selfish and I quickly discovered we could avoid it by getting off on the club level at the 23rd floor and avoiding the lovely concierge team altogether. After checking in we were escorted to our Park Deluxe King room. 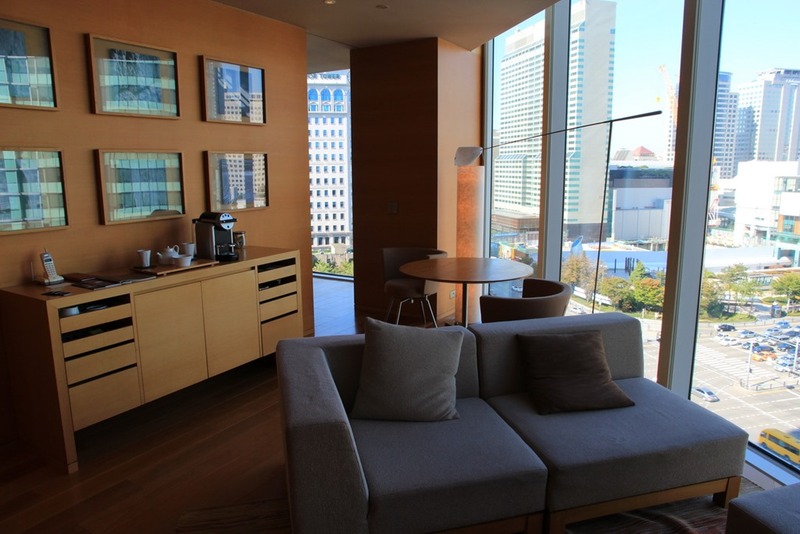 I originally tried to book us in a Park Suite using a diamond suite upgrade certificate. Unfortunately, no cash & point nights ever became available, and since I didn’t want to pay cash, I instead requested a Park King Deluxe room. 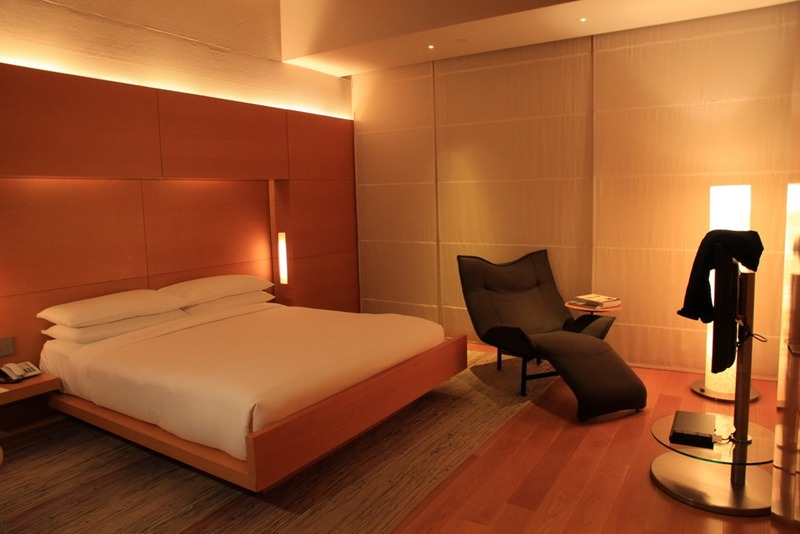 The room is beautifully decorated with slick modern furniture. 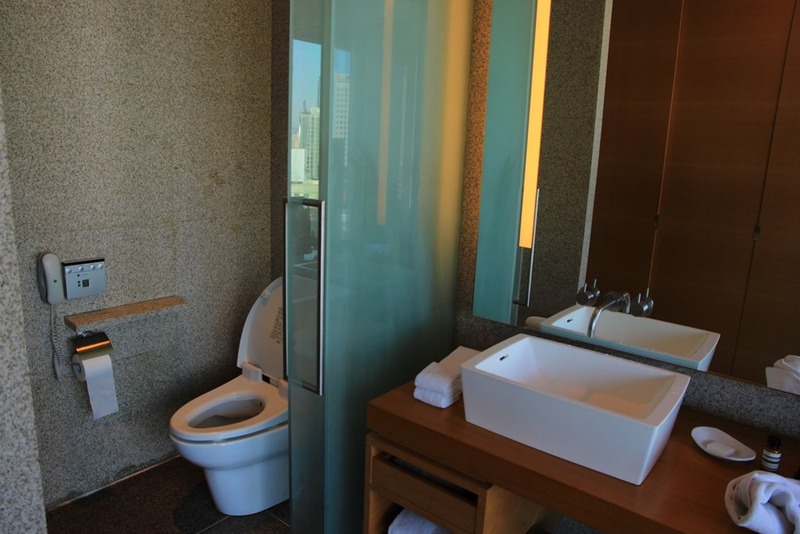 Where the Park Hyatts really shine, however, is their bathrooms. 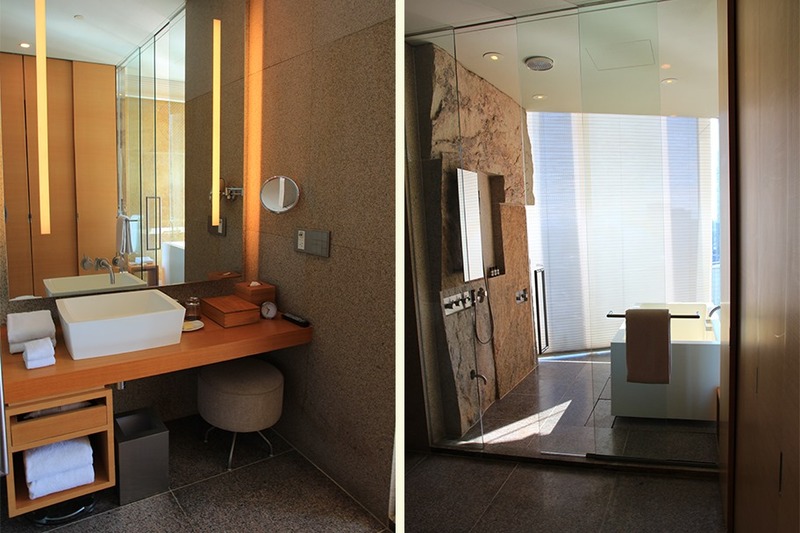 The Park Hyatt Seoul comes equipped with a Japanese style toilet and a wet-room style bathroom. Since Mrs. Selfish and I were exhausted from our long trip we opted to grab a small room service dinner. 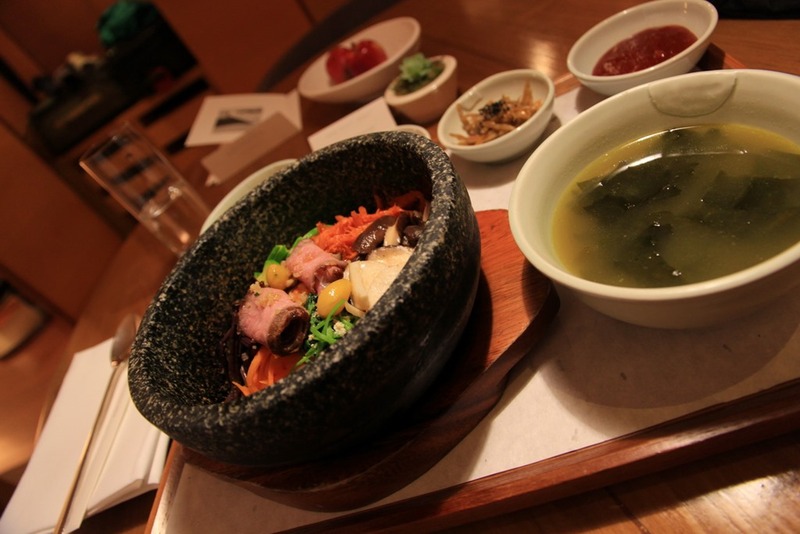 I ordered the bibimbap, since ya know, South Korea. 20 minutes later it arrived in a sizzling hot stone bowl. Our stay was excellent and restful… until 4am our 3rd night when we were awakened at 4am by loud noises in the room above us. I’m not sure if some Korean salary men had hired some *ahem* working ladies, or if there was a bet over who could move the furniture the furthest, but for over an hour the room above us did their best to stop us from getting any sleep. Normally I’d try to power through it, but Mrs. Selfish wasn’t having any of it. After three calls to the front desk, Mrs. Selfish managed to reach the night manager, who personally came down to apologize and offered to move us to a different room. I was impressed by the resolution and his genuine apologetic attitude. There’s not really anything a hotel can do to quiet down raucous guests, but I wasn’t really expecting to be moved. Especially to a suite! The suite was basically the same as the Park King Deluxe room, except it had an additional living room which came loaded with snacks. 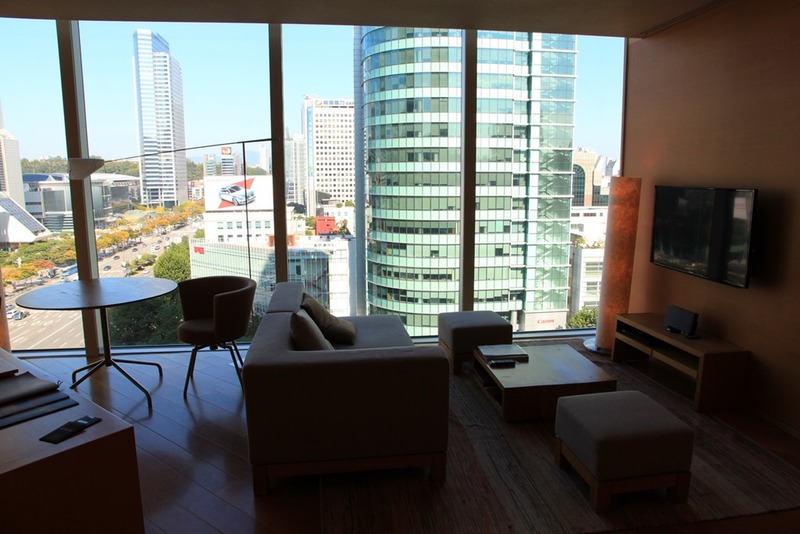 Like the our deluxe room before it, our suite had an excellent view of Gangnam. Since the manager had given us two keycards, I decided to pop into the other room to see what it looked like. For you guys, of course. 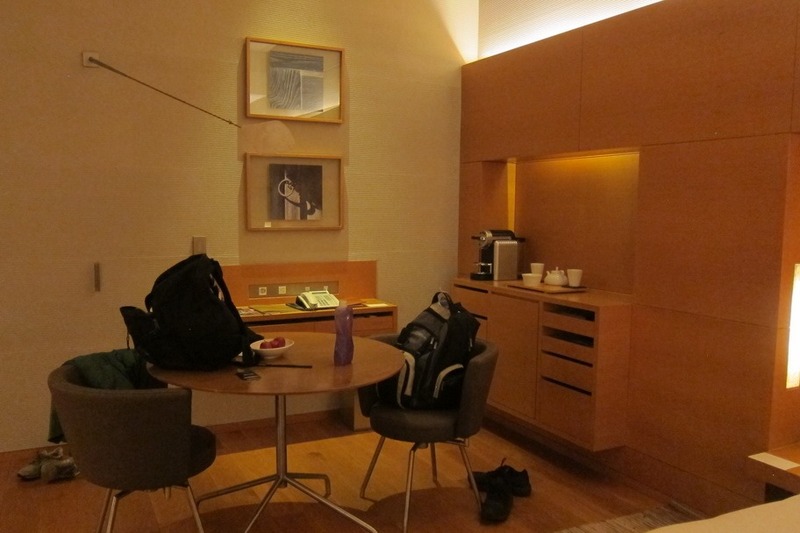 Our other would-be room was a standard king, facing the quieter street behind the Park Hyatt. 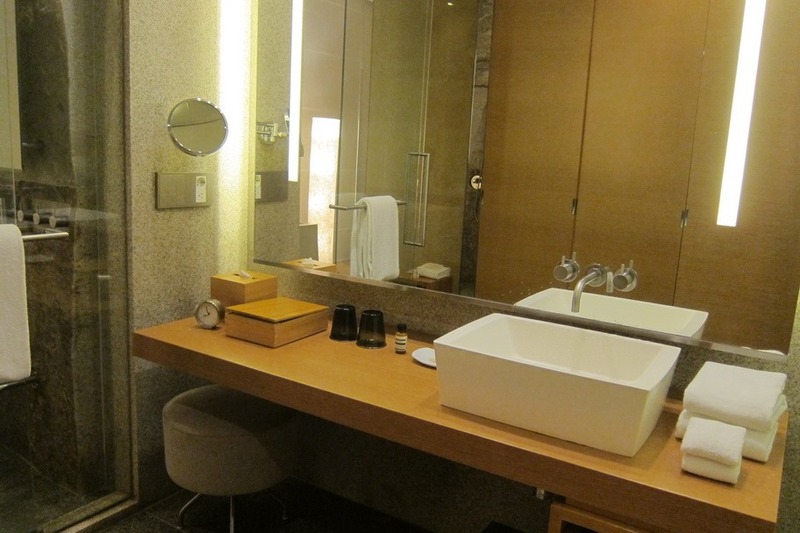 While the standard room was just as nice as the deluxe, it was noticeably smaller. Everything felt a little more squished. Still nice, however. 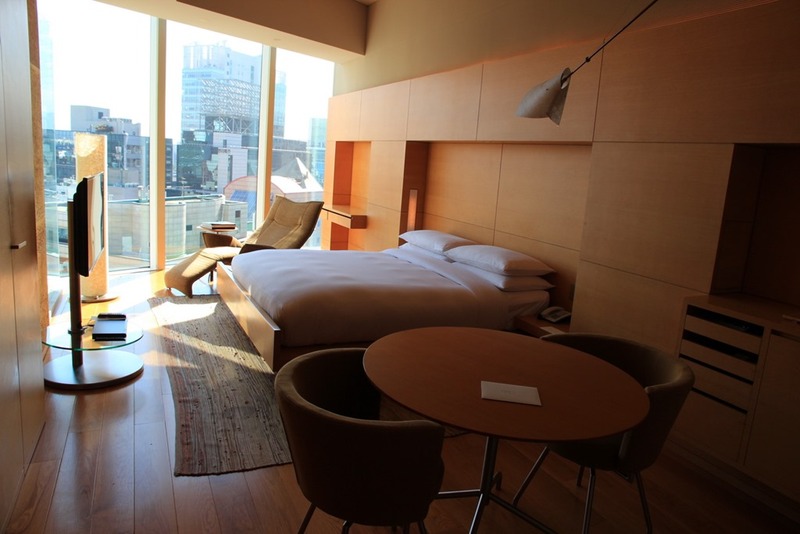 During our Selfish Year trip I found out I’m actually a huge sauna/onsen enthusiast, so I was interested to see how the Park Hyatt Seoul stacked up against its Japanese counterparts. 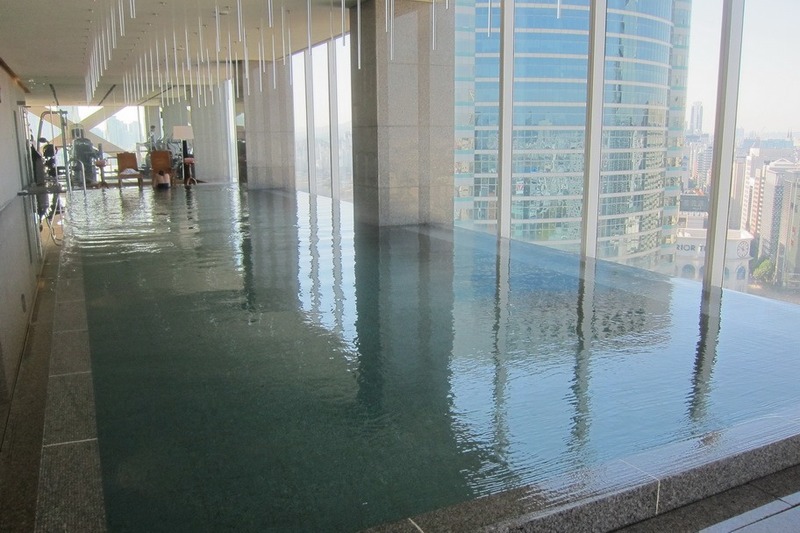 The club is located on the 23rd floor, while the pool is located on the 24th. To get from one to the other you have to take a private staircase up. 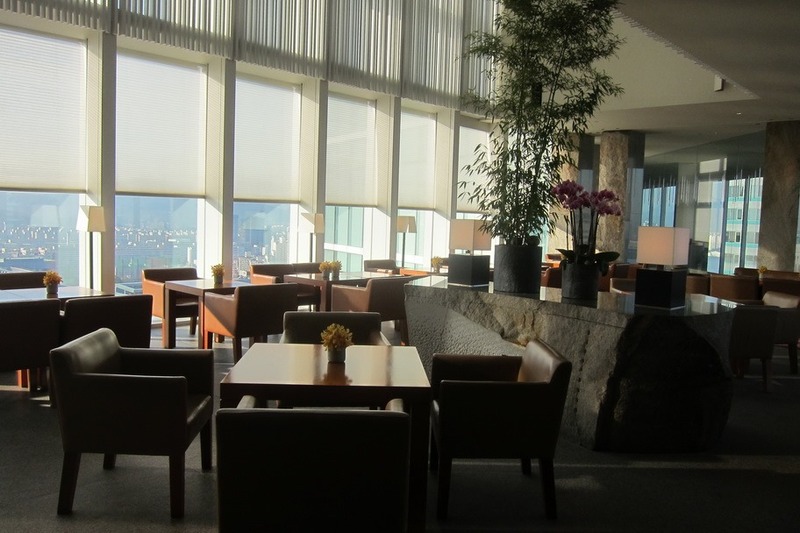 From there, you’re awkwardly separated from the 24th lounge by a thin wall of glass. That being said, the pool is frickin’ awesome. I ended up swimming laps here twice during our stay, and while the pool isn’t really made for lap swimming (it can only fit 2-3 people comfortably) it tends to be pretty empty. For anyone wanting to swim laps, the pool is 17m long – so you’ll have to swim 95 lengths per mile. 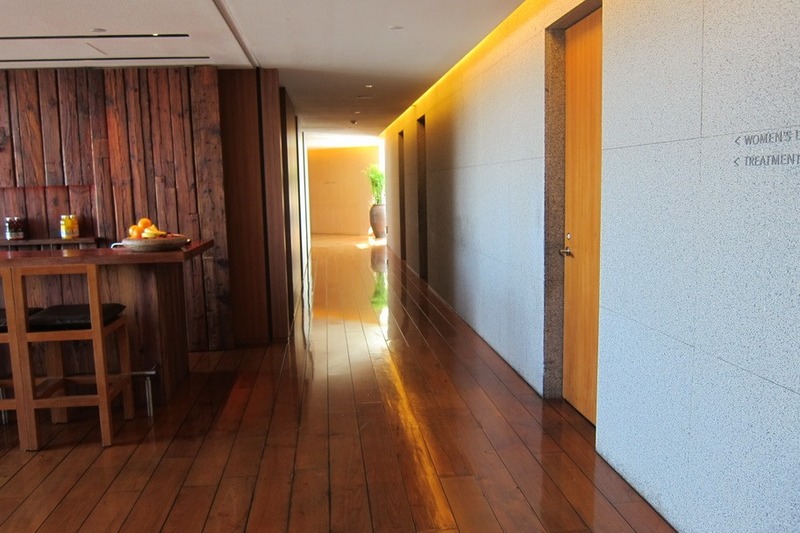 The sauna area is pretty small compared to the Park Hyatt Tokyo. 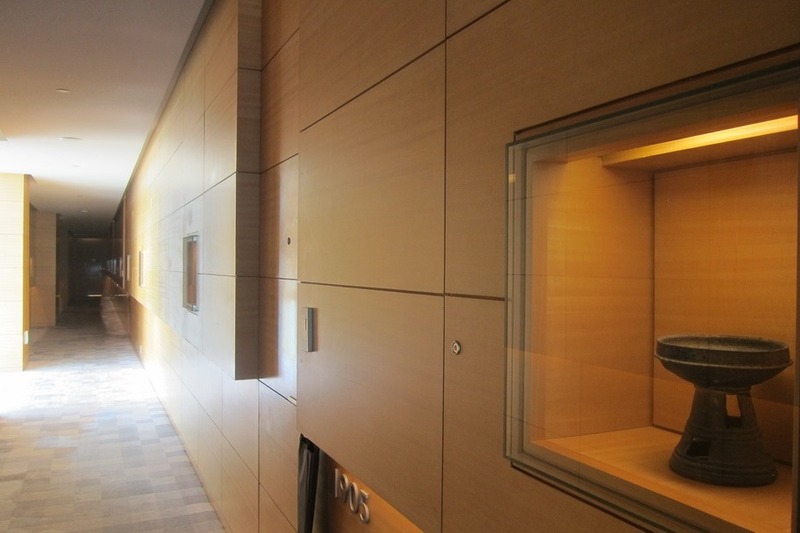 Where that hotel had three different saunas at different temperatures, the Park Hyatt Seoul only has one. Like the PHT, it does have a hot tub and plunge pool, however. 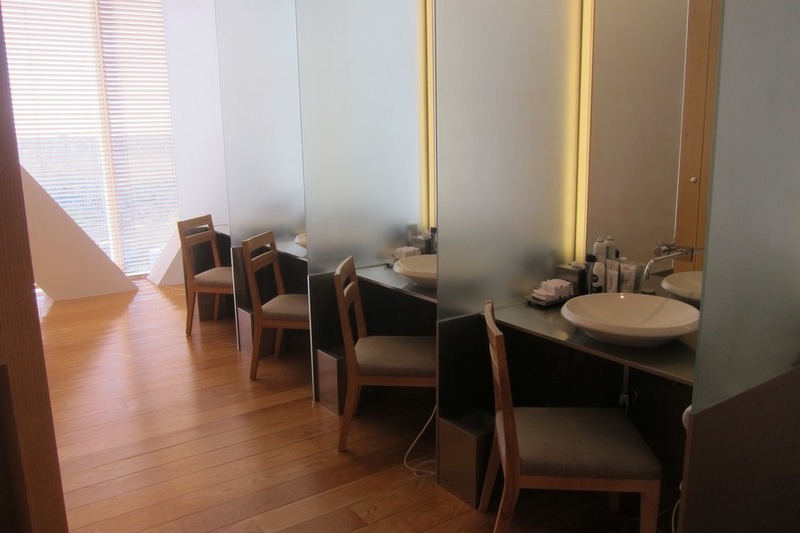 There’s also a separate area to shower, shave, dress, and lotion up. 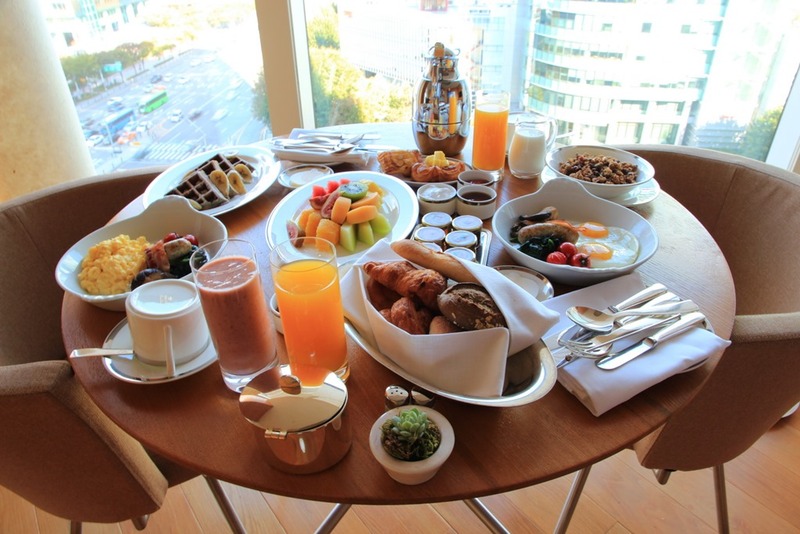 As diamond members Mrs. Selfish and I were given the option of a room service breakfast or eating at the Cornerstone restaurant on the 2nd floor. 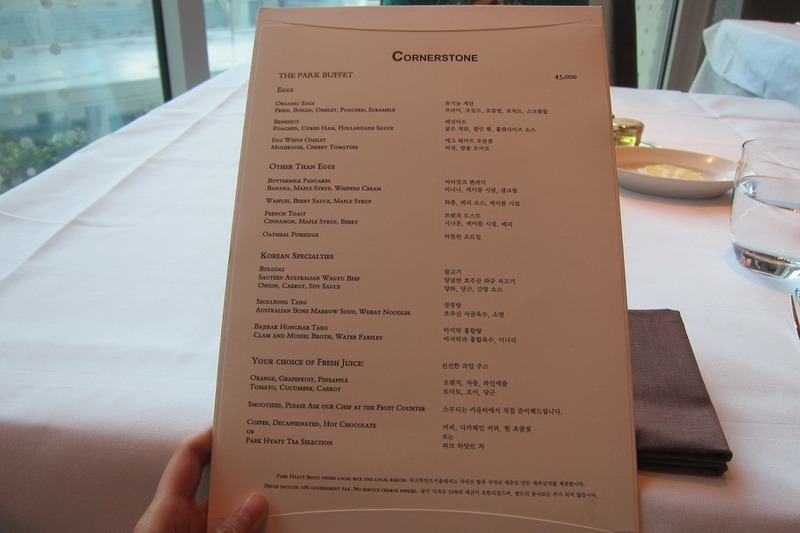 I had heard good things about the Cornerstone restaurant, so we decided to check that out first. 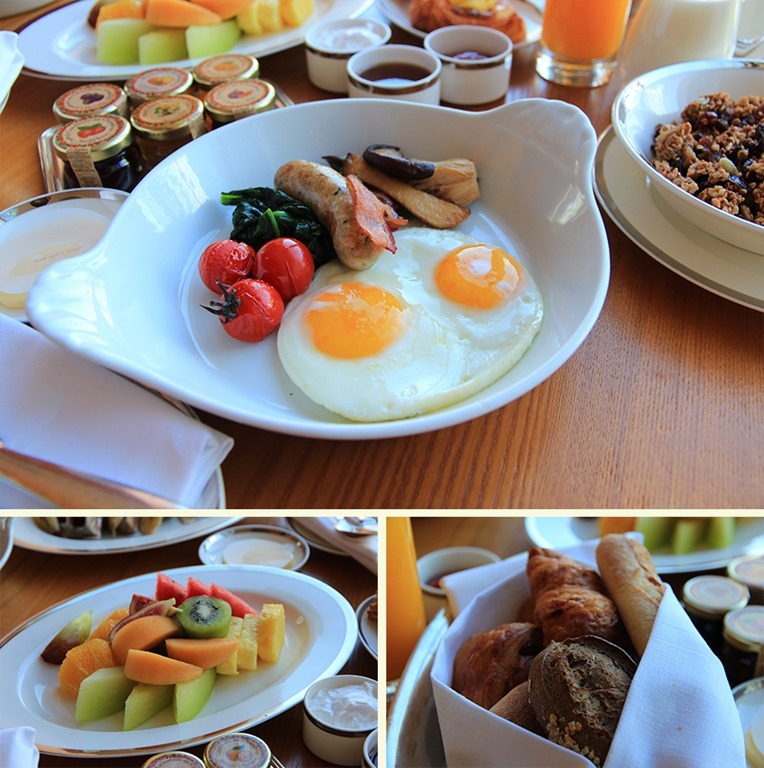 Breakfast here is awesome. They have a full meat spread for Europeans. They have a smoothie bar where they make any type of juice smoothie you could ever want. They have a bakery where they make fresh croissants on site. Fresh #$*&#$ croissants! 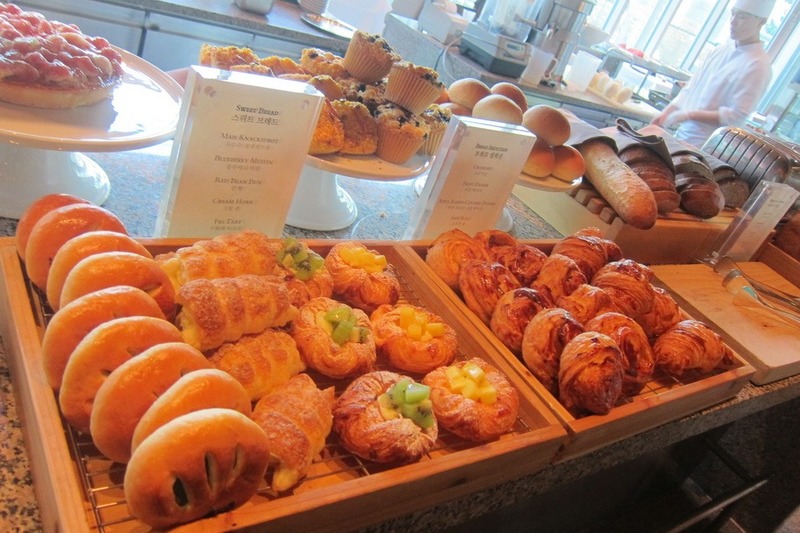 These were easily the best croissants I’ve ever had from a hotel, and topped pretty much any croissant you could find Stateside (and even a few in Paris – yep, I said it). Plus their muffins were excellent – Mrs. Selfish grabbed one every day to bring back to our room, which the staff thought was hilarious. 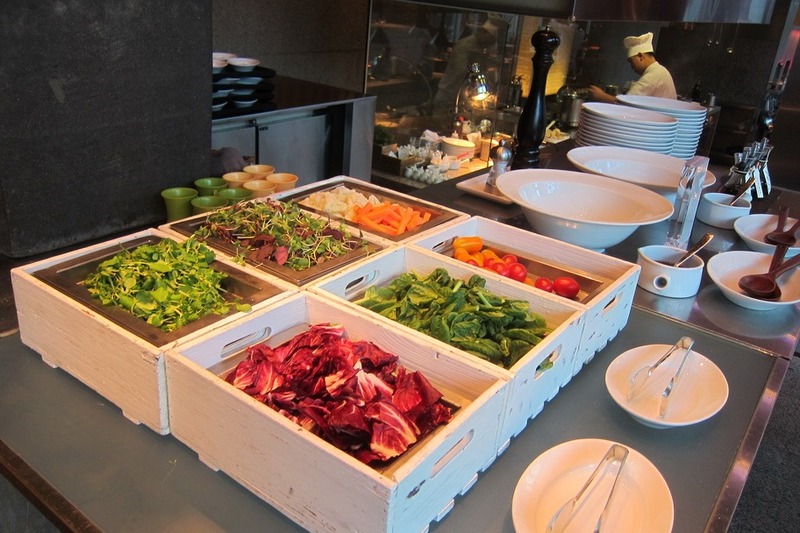 There was also a salad bar and full buffet option. On top of that, the service was excellent. I counted no less than 8 servers, all buzzing around, refilling waters and coffees and taking away plates as soon as they were empty. 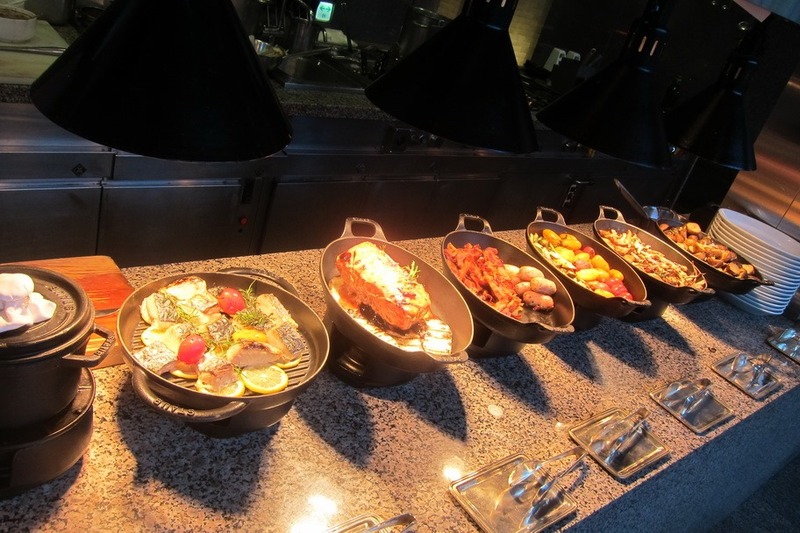 As a diamond member we were allowed to order anything off of the menu, which we did, liberally. While both the Western and Korean food options were excellent, I’d have to say that the Western breakfast edged it out for me. That being said, the Korean chicken sausage and mushrooms were well worth eating. We also decided to give room service a try. 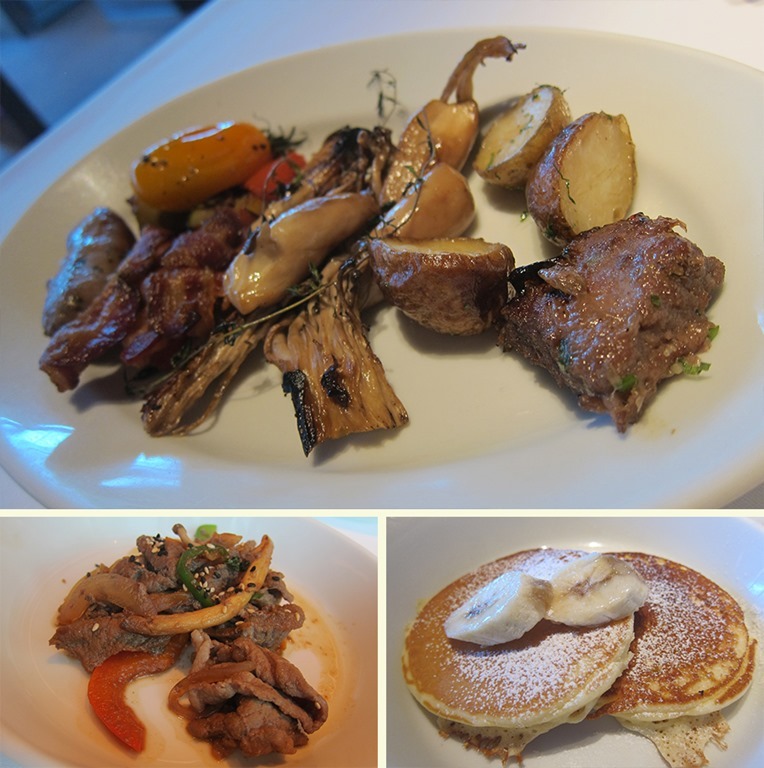 While the food was excellent, they didn’t really have an equivalent of the “Japanese breakfast” like the Park Hyatt Tokyo has, so I found it was better to eat at Cornerstone overall. Still, there is something nice about eating in one’s room. 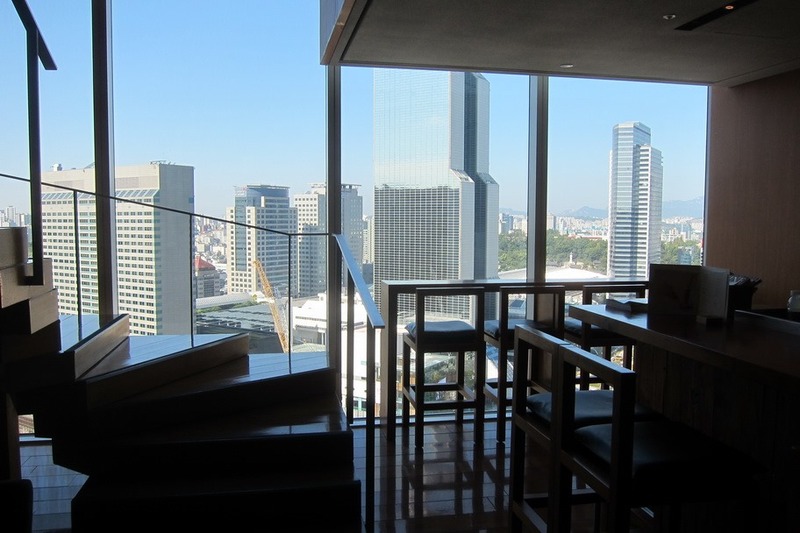 If you’re looking to stay in Seoul, you could do far worse than the Park Hyatt Seoul. With excellent rooms, food, and service, this is definitely one of my favorite Park Hyatts. The only downside, however, is location. 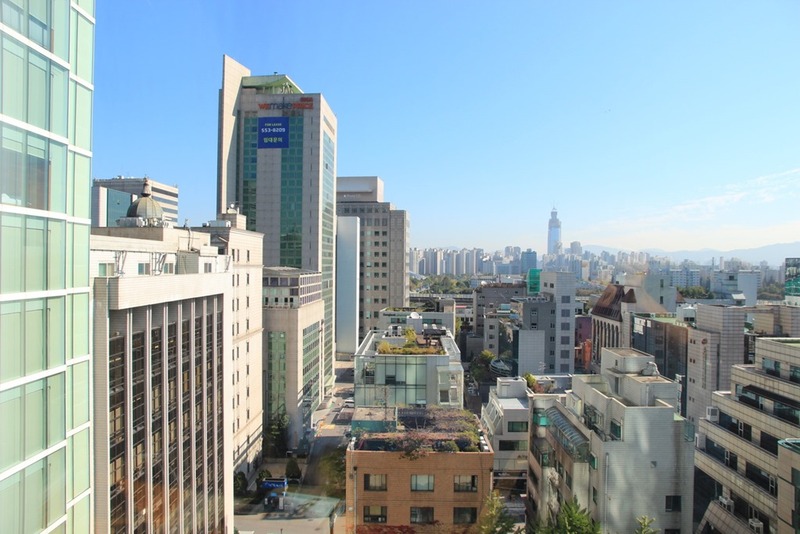 While the Park Hyatt Seoul is located directly above the Samseong Metro Station it is on the southern side of Seoul, and is roughly 30 – 40 minutes away from most tourist attractions. 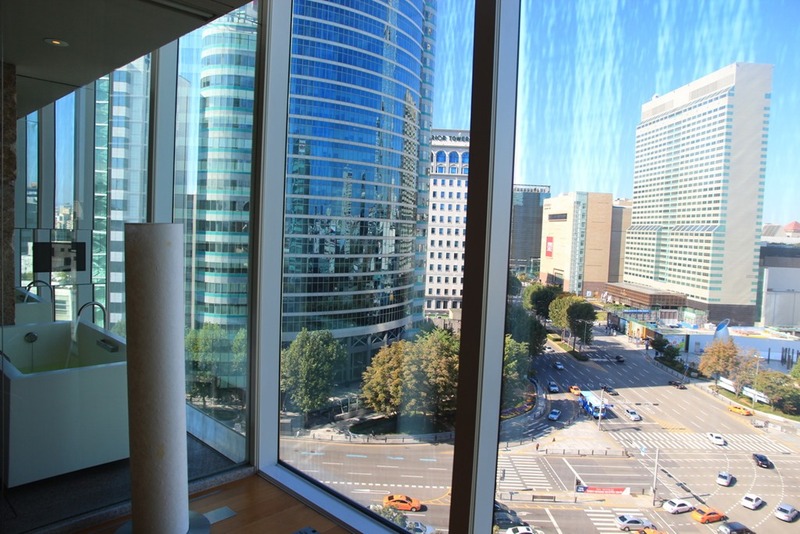 That being said, I felt like it was totally worth it, but if you’re interested in something closer to the action I’d consider the Westin Chosun.